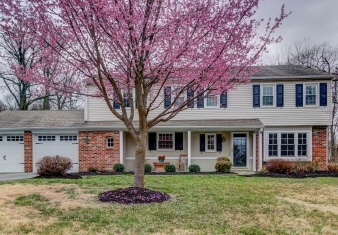 This inviting colonial offers the easy and functional open concept living spaces you've been looking for with a beautifully updated kitchen and stunning great room addition. Sunny and bright with warm cherry cabinets, this kitchen has it all: a large center island that comfortably seats 3-4, newer KitchenAid stainless appliances, granite counters, a tumbled tile backslash, and even a convenient built-in desk area! You'll want to relax and start every day with a warm cup of coffee in the gorgeous breakfast room overlooking the lovely and private back yard. The kitchen and great room have open flow to the stunning great room addition thoughtfully designed by local architect Cam Lacey. With a vaulted beamed ceiling, custom moldings and up-lighting, built-in cabinetry and graceful custom windows, this is will be your favorite room in the house!